… doesn’t come very often in my life at CVM. But here I am in the middle of one of the rare moments where I don’t have an exam at all during the week. And it’s pretty nice to know I can relax and just chill for a bit and not worry too much about any impending exams. Lots of things are going on right now. About to really get started with my thesis work (which is the characterization of the heart anatomy of two native Philippine turtles by ultrasound and electrocardiogram) by trying to get people to sign up for my thesis panel. Continuing junior clinics with swine this week. Ended up winning 2nd place in CVM’s Rodeo Club Philippines Round-up quiz con last night with my friends Jae and Casey. Spending the weekends in Fort Bonifacio and Makati in Manila since I’m apartment sitting for my friend Isabelle. Got to do my first dehorning (cornuectomy) and am now preparing to be assistant surgeon for our next surgery for our ovariohysterectomy in a goat. Was approved as the first Filipino DJ on WGSpectacle to broadcast for all Asian listeners. And of course studying every now and then. It’s just nice to breathe every once in awhile you know? 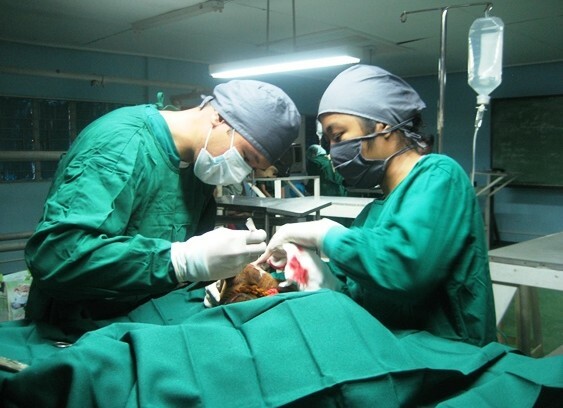 While I wind down for tonight, I’ll leave you with this picture of me performing the cornuectomy on our goat. (Don’t worry–nothing too gruesome… just a little taste).